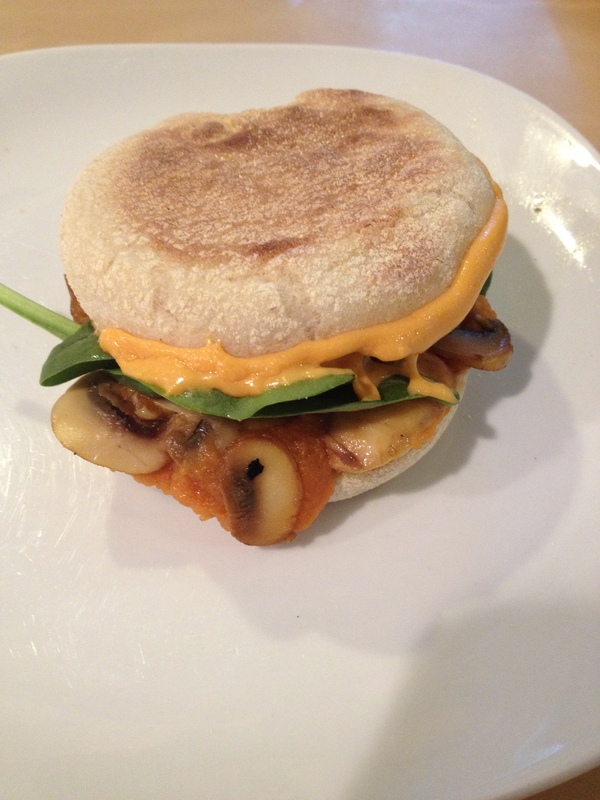 Well well well, it’s the first Sunday of Vegan MoFo 2014 and I AM SO EXCITED! 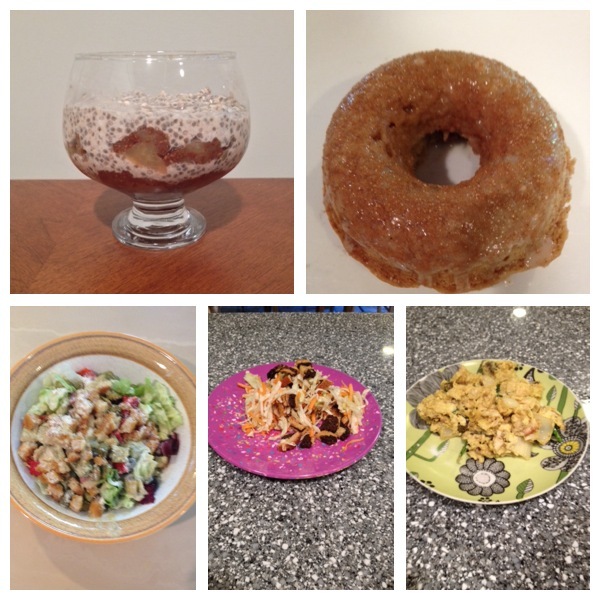 to give you my first Sunday Brunch recipe, because brunch foods are my favorite foods of all time. This one was inspired by a fast food company that shall not be named. I loved their similar, non vegan sandwiches in my pre-vegan days. It was a weakness of mine, really. I tried to get it as close as possible, but it did fall short a bit. I think that if you really want to make it extra delicious, you might try frying the griddlecakes in a bit more oil than I did. I didn’t want to because I don’t like eating a lot of oil. 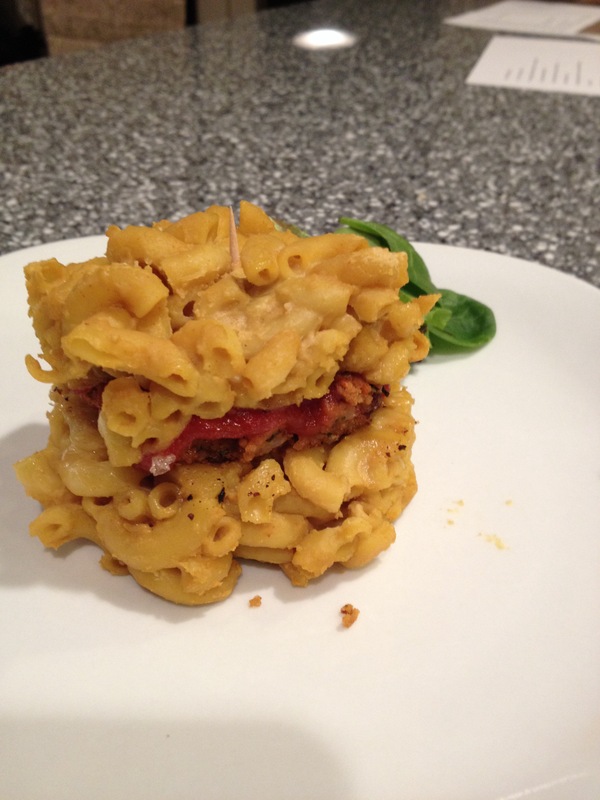 This recipe includes my recipe for sausage patties from the first Meaty Meatless Monday of MoFo 2014, which can be found here. Cook sausages according to recipe. Keep sausages in an aluminum foil pouch on a single layer so that they stay warm while you make the pancakes. You can maybe start the pancake batter while you cook the sausages if you’re a good multitasking cook. Heat a griddle over medium heat sprayed with cooking oil. Place flour, baking powder, and evaporated cane juice in a large mixing bowl and mix together with a spoon. Add almond milk, maple syrup, and vegetable oil and mix until smooth with the spoon. Place brown sugar into batter, and briefly mix but not fully combine. Turn the griddle to medium or low heat, depending on your stovetop’s intensity. Pour batter onto griddle (about 1/4 cup worth) and flip when bubbly or when the edges are starting to look firm. Fry on the other side until thoroughly cooked. 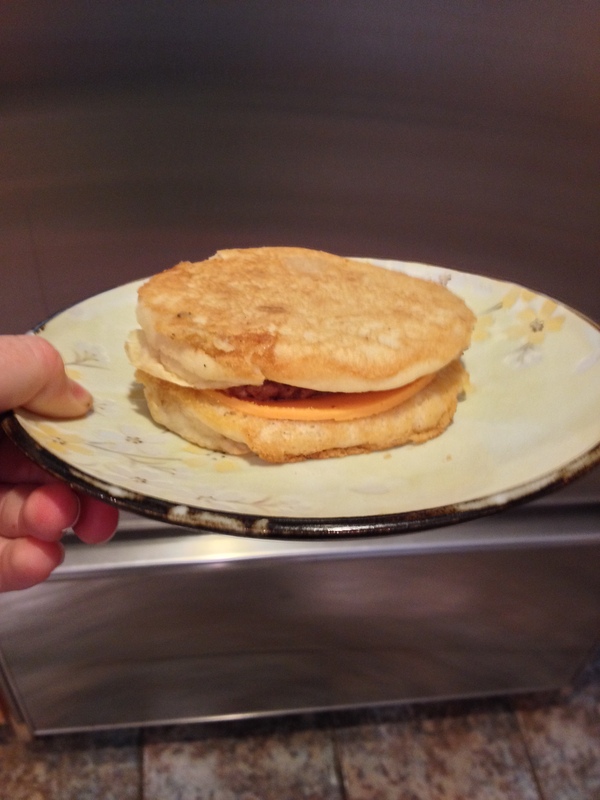 To assemble the griddle sandwiches, place a slice of the Daiya cheese on to one pancake while still hot. Place the sausage on top, and then another pancake. If you want to eat leftovers or save for later and reheat, microwave the cold pancake, daiya cheese, and sausage sandwich in a microwave for about 30 seconds, or broil in a toaste oven until the cheese melts and the sandwich is thoroughly heated. also, see randomofo.com for a fun way to see other blogs participating in this blogging event (if not already familiar with it)! 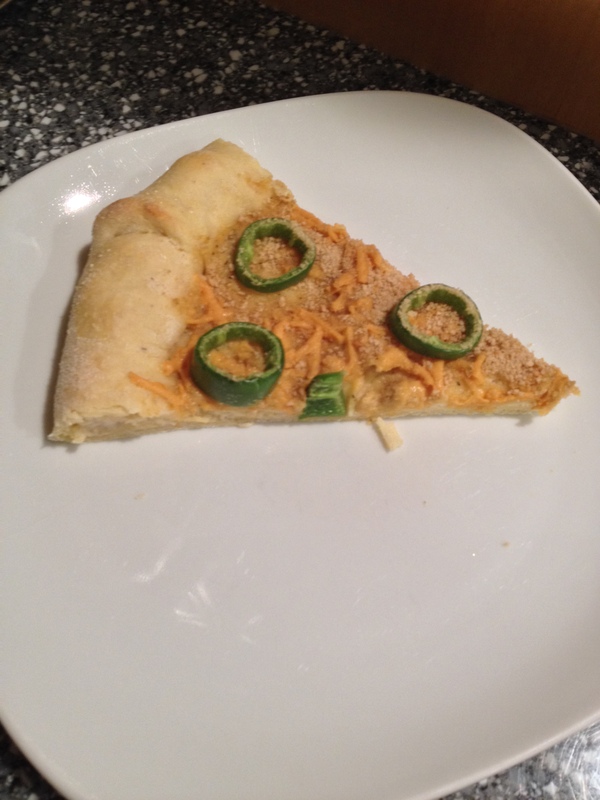 Peter Piper Picked a (vegan) Jalapeno Popper Pizza Recipe! with cornmeal cream cheese stuffed crust! a lot of alliteration here! With Vegan Pizza Day coming up at the end of the month (June 28 to be exact- rsvp to the facebook event!) I wanted to provide you with a kickass, blow your mind, original recipe for a unique vegan pizza for this occasion. Today I tested out my idea. I was worried it would not go as planned, but it came out flawless. 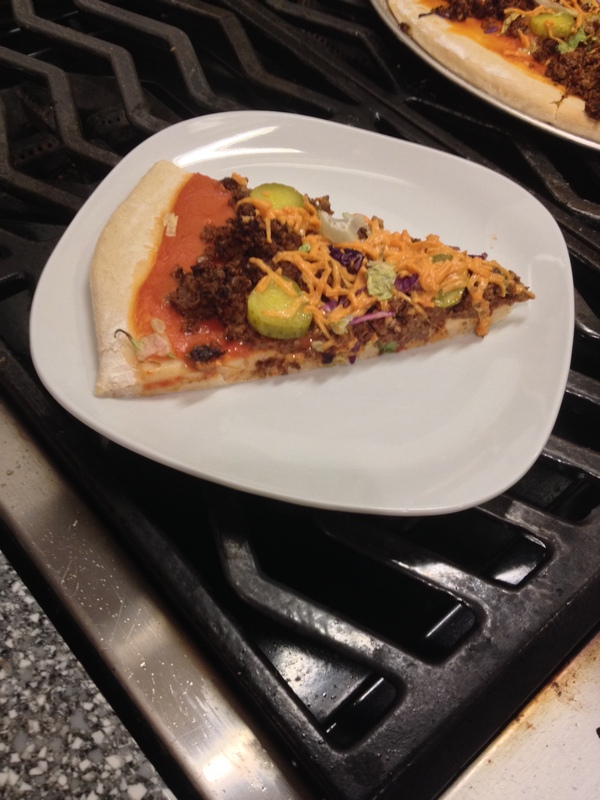 It has a cornmeal crust made from this recipe, a cauliflower white sauce, sliced jalapenos, daiya cheddar, cream cheese stuffed crust, and a sprinkling of whole wheat breadcrumbs. Here is the recipe. 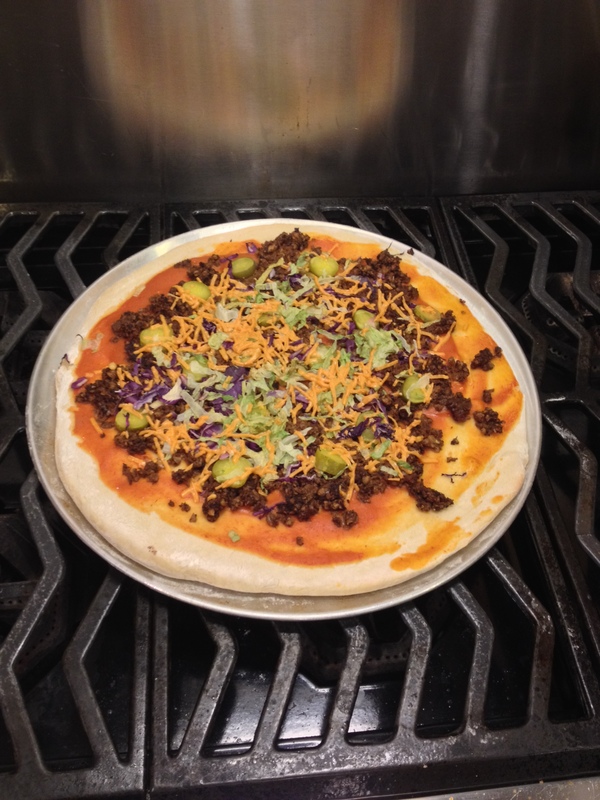 I have taken lots of pictures throughout the pizza making process to explain what I did a bit better. Make the dough according to recipe. Let rise and make the sauce. Steam cauliflower until soft, about 5 minutes. Place cauliflower and all other ingredients in a blender and blend until smooth. Place into a saucepan, and on medium heat, whisk frequently until bubbling and thickened a bit. Roll out the dough into a large circle. You will want to use extra flour/cornmeal on the surface and on the rolling pin to prevent sticking. Mix/stir up the vegan cream cheese until thick with a knife if it is separated as mine was. Using a tablespoon, place little dollops of the cream cheese a short distance away from the edge of the crust (see pictures below for a good idea of what I mean here). 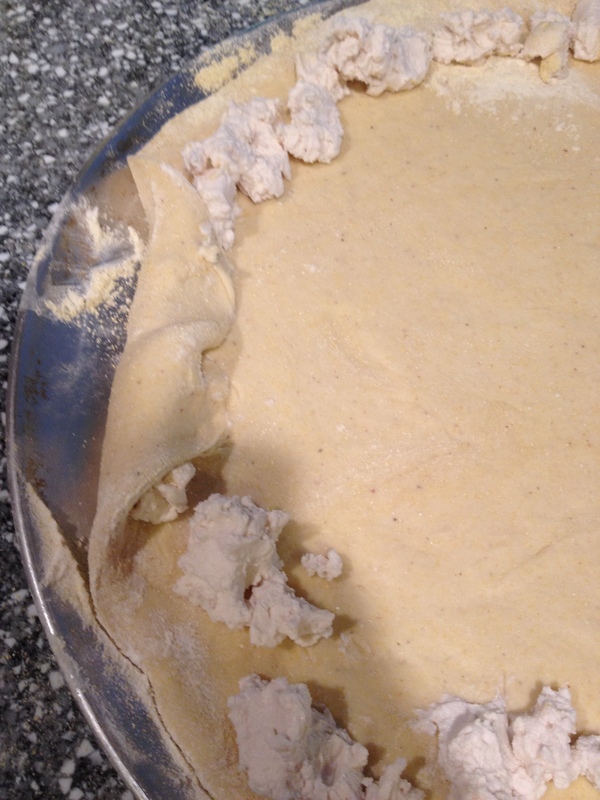 Then fold over the edges of the crust around it, pinching to secure slightly. Place about 2/3 cup or whatever you need of the sauce. You may need the whole batch, or you may need less, depending on how big your crust is. I used 2/3 cup. Sprinkle Daiya cheddar shreds around the top, use as much or as little as you like. I used about 1/2 cup. 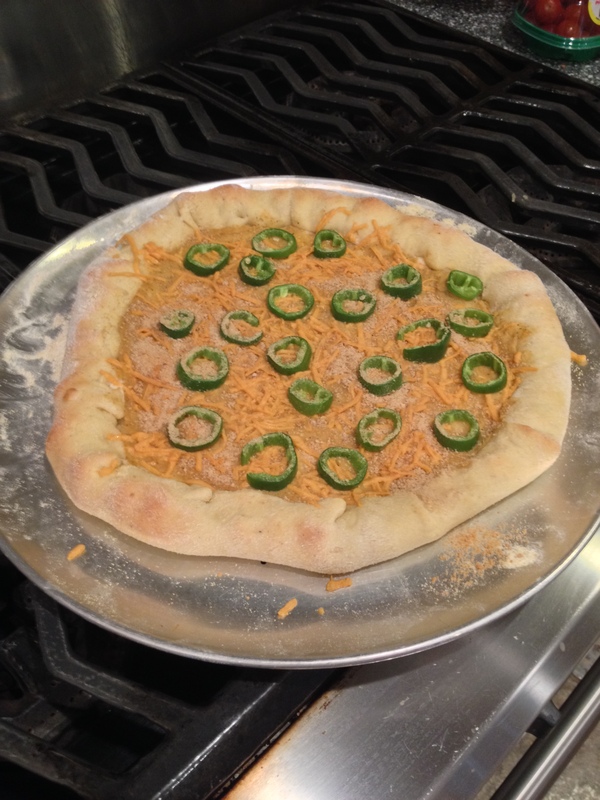 Place sliced jalapeno slices on top of the cheese. Sprinkle two tablespoons of whole wheat breadcrumbs. Bake 12-15 minutes in oven. Eat! And enjoy, because it’s pretty amazing if I dare say myself. 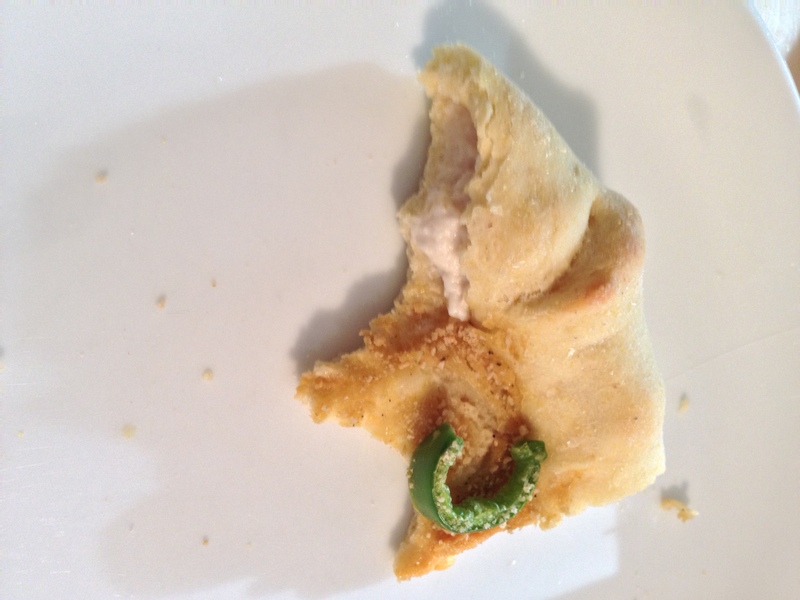 A detailed picture of how I stuffed and folded the crust.